The outpouring of public grief in Kenya over al-Shabaab’s gruesome massacre of 152 students at a University campus in the northeastern town of Garissa turned into frustration as hundreds of students from the country’s universities participated in protests demanding improved security at higher learning institutions. The attack, which al-Shabaab said was in retaliation for Kenya’s military operations in Somalia, was the deadliest since al-Shabaab’s 2013 attack on the upscale Westgate Mall outside Nairobi that claimed the lives of 68 people. 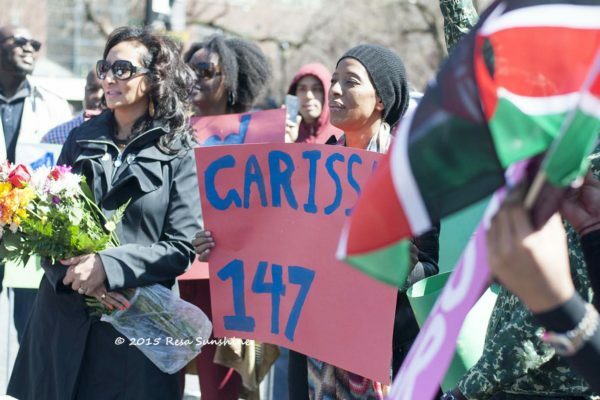 The Garissa massacre had all the hallmarks of previous attacks: the siege of a poorly defended soft target, the shock value of mass casualties, and, a calculated effort to undermine religious tolerance by separating and executing non-Muslims. The message seems to be resonating. Non-Muslim staff at the Garissa hospital after the attack launched a go-slow, complaining that they feared for their safety. Non-Muslim professionals continue their exodus from northeastern Kenya, undermining government efforts to integrate this historically marginalized region. The government has even bowed to pressure to close the university and transfer students elsewhere. The frustration has spilled into the Kenyan parliament, with some opposition lawmakers demanding that Kenya withdraw its forces from Somalia calling their presence there “unproductive.” The legislators organized a demonstration of several thousand to press their point—a major shift from a longstanding parliamentary custom that has seen lawmakers rally behind the president when the nation is under attack. Not this time round. Opposition leaders instead held a lengthy meeting with two visiting U.S. Senators urging American support for the withdrawal of the Kenya Defense Forces (KDF) from Somalia. Local media stories suggest that the government is “struggling to find an appropriate response.” The Kenyan Air Force bombed al-Shabaab positions in Somalia. President Kenyatta called for 10,000 police recruits to report for duty. Several bank accounts and Somali money transfer agents have been frozen. The Kenyan government has given the United Nations three months to relocate a camp housing more than half a million Somali refugees in northeastern Kenya. Moreover, the government is constructing a 440-mile wall along the entire length of its border with Somalia. These decisions are creating fears that the historically fraught relationship between Kenyan Somalis and the state might once again become inflamed, undermining counterterrorism objectives. After a spate of grenade attacks in 2014, the government arrested more than 4,000 people, mainly ethnic Somalis, many of them detained without charge for as many as eight weeks, with some deported to Somalia. The incident feeds into strong narratives of victimization that have historically been prevalent in the Somali community. Public confidence in the government’s ability to provide security impacts the success or failure of counterterrorism efforts. Closely linked to this is the public’s resilience to narratives that might deepen religious and ethnic fissures and play into the hands of terrorists. Rupturing this resilience is exactly the objective of such terrorist acts so as to create an atmosphere of fear and paralysis that would generate public pressure on the government to make policy reversals. Addressing these concerns is paramount as the Garissa attack is not an isolated event but part of an ongoing escalation of terrorist incidents targeting Kenyan citizens. In fact, Kenya seems to be more important to al-Shabaab’s long term strategy than ever before. Since the 2013 Westgate event, al-Shabaab has carried out 63 attacks in Kenya, killing 415 people. This compares to 42 attacks between 2012 and 2013 resulting in 77 deaths. Al-Shabaab’s structure is now composed of two interlocking organizations in Somalia and Kenya. The Kenyan structure (commonly known as Al Hijra), although largely separate, remains subordinate to the mother body in Somalia, which appoints the Emir for Al Hijra. This organizational structure means that attacks can be planned independently in Kenya, a capability that is strategically important for a movement determined to sustain itself despite suffering substantial territorial losses in Somalia due to concerted military pressure by the African Union Mission to Somalia (AMISOM). While much attention in the aftermath of the Garissa attack is understandably focused on the responsiveness and capability of the Kenyan security forces, the larger challenge is at the governance level. Maintaining social cohesion in the face of a sustained effort by al-Shabaab to foment ethnic and religious divisions in Kenya is vital for marginalizing extremist actors and avoiding sectarian strife. Key to this will be building trust in the effectiveness, professionalism, and transparency of Kenya’s security sector. Nelson Odhiambo, “Experts Split on Calls to Withdraw Kenyan Troops from Somalia After Terror Attack,” Daily Nation, April 12, 2015. Murithi Mutiga, “Are the Terrorists of Al Shabaab about to Tear Kenya in Two?” The Guardian, April 4, 2015. Abdullahi Boru Halakhe, “The Precarious Fate of Kenyan Somalis,” Al Jazeera, April 19, 2014. Sunday Nation Team, “Raila Asks U.S. to Help Kenya Leave Somalia,” The Daily Nation, April 12, 2015. “Understanding Terrorist Threats in Africa,” Africa Center for Strategic Studies, September 26, 2014. Terje Østebø, “Islamic Militancy in Africa,” Africa Security Brief No.23, (Washington DC: Africa Center for Strategic Studies, November 2012). David Richards and Greg Mills, Victory Among People: Lessons From Countering Insurgency and Stabilizing Fragile States (London: Royal United Services Institute, 2011).